Atletico Argentino Junin (LigaA) agreed terms with 29-year old American point guard Raheem Singleton (182-84kg-89, college: Maine). 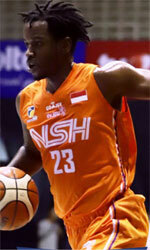 He played this summer at Siliwangi in Indonesian IBL league. In 6 games he had very impressive stats: 17.2ppg, 6.3rpg, 4.8apg and 1.8spg in 2017 season. In 2013 (a year after he left the college) Singleton was drafted by London Lightning (NBL Canada) in first round (10th overall). The former University of Maine staris in his seventh season in pro basketball. The list of the past achievements is quite long as among others Singleton won PBL championship title in 2016. He was also voted NJCAA D2 All-American 3rd Team back in 2010 at his college time. Singleton is quite experienced player. He has played also professionally in PBL (Rochester R.), NBA G League (Maine Red Claws), Canada (The Storm and Windsor Express) and EBA (Metrowest Ballas).